Editorial note: This is reprint of a press release I wrote for UF Health News and Communications, and it was my first whack at a press release. But I can tell you this guy is pretty interesting if you decide to write about him! John “Bobby” Goulding, Ph.D., a postdoctoral fellow in the department of pathology, immunology and laboratory medicine at the University of Florida, is in a scramble to help create safe and effective vaccines to prevent and fight human respiratory viruses. While past vaccines focused solely on triggering antibody responses to fight the viruses, Goulding and his colleagues are shifting the emphasis to T cells, otherwise known as white blood cells, because of their ability to target specific pieces of a virus. Figuring out how to create an army of these virus-fighters will aid in the creation of a new generation of vaccines that are safe and long-lived and that target viruses we don’t have existing vaccines against. He recently received the prestigious Thomas H. Maren Junior Investigators Postdoctoral Award to fund his research. The $50,000 award was founded by UF’s first chairman of pharmacology, Thomas H. Maren, M.D., to help postdoctoral students in the UF College of Medicine further their scientific goals. Rapidly mutating viruses in the human respiratory tract account for millions of deaths worldwide each year. Because invasive attackers such as avian flu and others mutate so quickly, the antibody response prompted by current vaccines is often not strong enough, which is why the flu shot is seasonal and not a one-time-fix-all. Goulding explains that while antibody vaccines have been very successful in eradicating certain viruses, most notably the virus that causes smallpox, they have not been as effective in rapidly mutating viruses or retroviruses, such as HIV, which can integrate into someone’s DNA. T cells, which are a type of white blood cell, work a bit differently, he said. They can kill a virus that has already infected a cell, whereas antibodies cannot do this. Goulding studies a subset of T cells, called CD8+ T cells. Once the pieces of a virus are mopped up, digested and presented on the surface of certain cells in the body, the CD8+ T cells recognize the chopped up virus bits and begin cloning themselves so they can rapidly and effectively kill cells that become infected with the virus. “Your body has essentially generated an army that’s really great at recognizing a really specific type of virus and killing infected cells,” Goulding said. He explains that this army would then be waiting to attack if a human actually came in contact with the virus later. 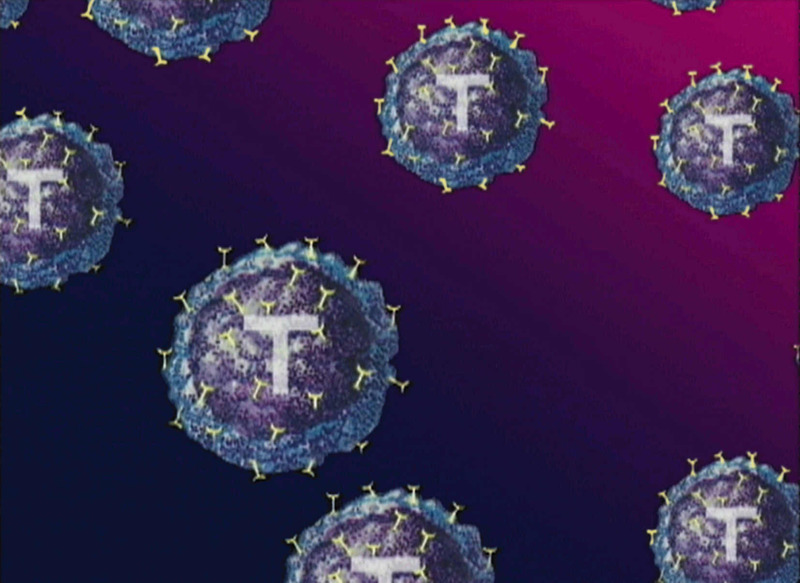 Goulding wants to figure out how to generate large numbers of these virus-specific T cells while preventing the vaccine from causing unwanted side effects. T cells need to be presented with digested virus in an inflammatory environment before they can begin cloning themselves. However, this inflammatory environment can cause side effects in people injected with the vaccine. Goulding wants to trick T cells into thinking they are in an inflammatory environment without disrupting the body and risking unwanted side effects. By thinking something is wrong, the cells will form the army and wait patiently until the foreign host attacks. He is currently looking at a group of receptors, called TNF receptors, which are part of the main decision-making team telling the T cells whether to multiply and wait ready to ambush an invading target virus. Due to aging populations, increasing antibiotic resistance and public skepticism about vaccines, Goulding says the public health impact of respiratory viruses and other infectious diseases are increasing.